WELLS, Maine — The longtime sheriff of Middlesex County, James V. DiPaola, was discovered dead yesterday from an apparently self-inflicted gunshot wound in a resort in this coastal town, authorities said. DiPaola, a 57-year-old Democrat with more than 30 years in public service, had announced abruptly a week ago that he would retire in January, after being questioned by the Globe about his plans to collect a state pension while continuing to serve as sheriff. He had also acknowledged an ethics investigation into his office. A statement released last night by the police in Wells, a southern coastal town, said DiPaola was discovered by hotel workers lying on a bed, with a gunshot wound to the head. A hotel maid had become concerned when DiPaola failed to leave his room by checkout time and summoned the manager of the Lafayette Oceanfront Resort on Mile Road, who used a master key to open the door. Wells police said when they entered the room, they found a note several pages long that DiPaola had left behind, along with the gun they believe he used to commit suicide. The Middlesex Sheriff’s Office confirmed “the sudden death’’ of DiPaola, a former Malden police officer and state representative who was first elected sheriff in 1996 and reelected this month. Reaction from top state officials to the news arrived swiftly. House Speaker Robert A. DeLeo, who had served in the Legislature with DiPaola, expressed similar sentiments. “My thoughts and prayers go out to his family,’’ the speaker said in a statement. A Middlesex sheriff’s deputy was posted at the DiPaola residence in Malden last night, turning away media. The house — a tan, three-bedroom residence that sits at the end of a steep cul-de-sac — was dark. The deputy said no one was home. DiPaola leaves his wife, Adeline, three daughters, and three grandchildren. Friends of DiPaola said they were baffled by his apparent suicide. One, who did not want to be quoted by name, said it was completely out of character for the sheriff, who was outgoing and affable, and seemingly well-adjusted. Katie Kelly, the manager of the Lafayette Oceanfront Resort, said she was the one who found DiPaola’s body. During 22 years in the hotel industry, she said, she had never encountered a suicide before. The resort, a 153-room, 14-building complex, is perched on the coast in an idyllic New England setting, with clapboard buildings and white wooden porches. It is one of dozens of lodging properties owned by the Lafayette family, which operates hotels and resorts in Maine, New Hampshire, and Michigan. A Wells police sergeant, Kent Berdeen, said it appeared that DiPaola shot himself with his service weapon, a Glock issued by the sheriff’s department. There were no reports of a shot being fired, the sergeant said, but it appears DiPaola used a pillow to muffle the gun. The sheriff’s body was examined by a state medical examiner, Berdeen said, and is expected to be released to the family today. DiPaola’s name had burst into the news in the past week, when the Globe reported that the longtime sheriff had hatched a scheme that would have allowed him to collect a $98,500 annual pension at the same time he earned a sheriff’s salary of $123,000. After reporters confronted him, DiPaola abandoned his plans to take advantage of a loophole in pension law and said that, instead, he would resign in January. The Globe reported his pension scheme and his change of heart last Sunday. That night, WFXT-TV (Channel 25) broadcast a story alleging that DiPaola pocketed money intended for his political campaign committee and had sheriff’s employees use official vehicles to pick him up on occasions when he had been drinking. The following day, DiPaola acknowledged that the State Ethics Commission was investigating the Middlesex Sheriff’s Office. That inquiry, he said, had nothing to do with his pension. Instead, ethics investigators are reviewing whether workers in the sheriff’s office raised money for his reelection, a practice forbidden by state law. The ethics commission turned the matter over to the Middlesex district attorney, who forwarded it to the attorney general last week, according to a law enforcement source. The attorney general’s office has not started its investigation. During his 18 years on the Malden police force, DiPaola served as a patrolman, sergeant, and undercover narcotics detective. He was elected to two terms in the state House. 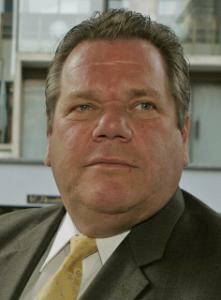 He won a special election for Middlesex sheriff in 1996, becoming the 29th Middlesex sheriff. He was reelected to six-year terms in 1998, 2004, and this year. Before he was reelected Nov. 2, DiPaola had hit upon a loophole in state law that would have allowed him to legally double-dip, collecting his salary and pension simultaneously. Unbeknownst to his staff and voters, DiPaola quietly filed retirement papers Oct. 28, although he continued to serve as sheriff. His plan was to forgo his sheriff’s salary until he was sworn in for a new term in January. Then, because of that hiatus in salary, he could qualify for his pension and salary. But the sheriff underwent a dramatic change of heart after being queried about his plan by a Globe reporter, saying it had sparked his conscience. “I’d always be remembered for this, for double-dipping, that that would be my legacy,’’ he said. Instead, DiPaola announced that, despite winning overwhelming reelection, he would resign Jan. 6, allowing the governor to appoint his successor. He also said because remaining in office would earn him only about $25,000 more a year than if he retired and took his pension, he decided it wasn’t worth it financially to remain in office. Paul Carew, a 58-year-old from Natick, stood outside the hotel last night with his eyes red. He had worked for several years under DiPaola and was vacationing in the same hotel where his boss of four years and friend of 15 years died. Carew, who led a veteran’s intervention program in the sheriff’s office, lauded DiPaola for his work with children and troubled veterans in Massachusetts. “When you’re in politics, especially with as many people as there are in Middlesex County, you’re bound to make enemies,’’ Carew said. Globe correspondent Matt Byrne contributed to this report.